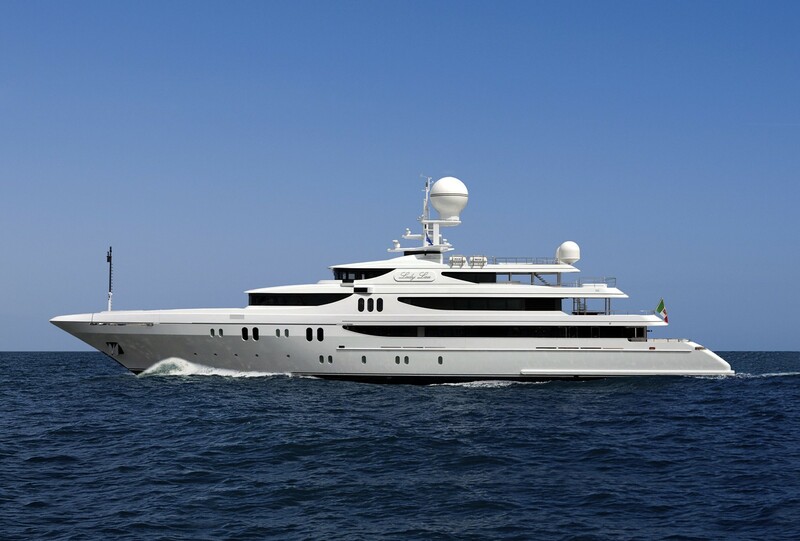 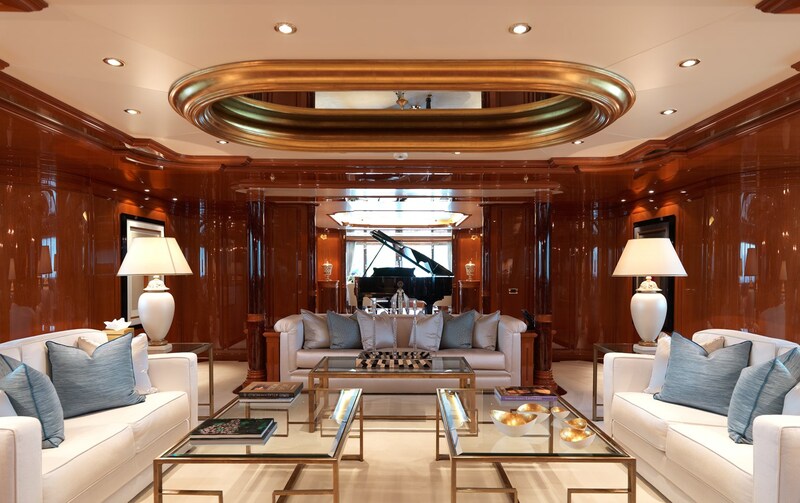 The 65-metre luxury motor yacht DOUBLE DOWN is characterised by classic and traditional lines and was constructed by Codecasa in 2010, following the precise wishes of her Owner, with original interior design by architects Franco and Anna Maria Della Role. 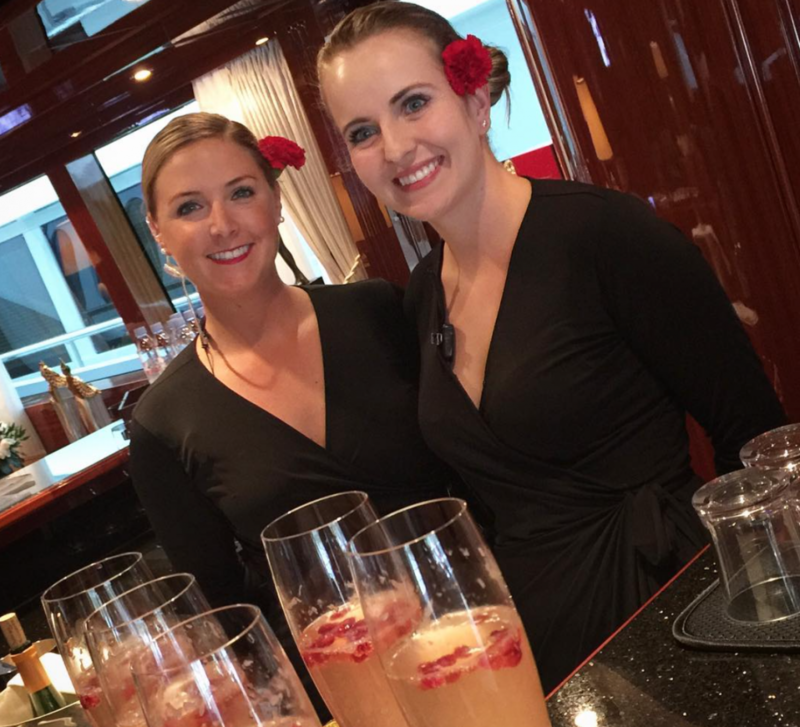 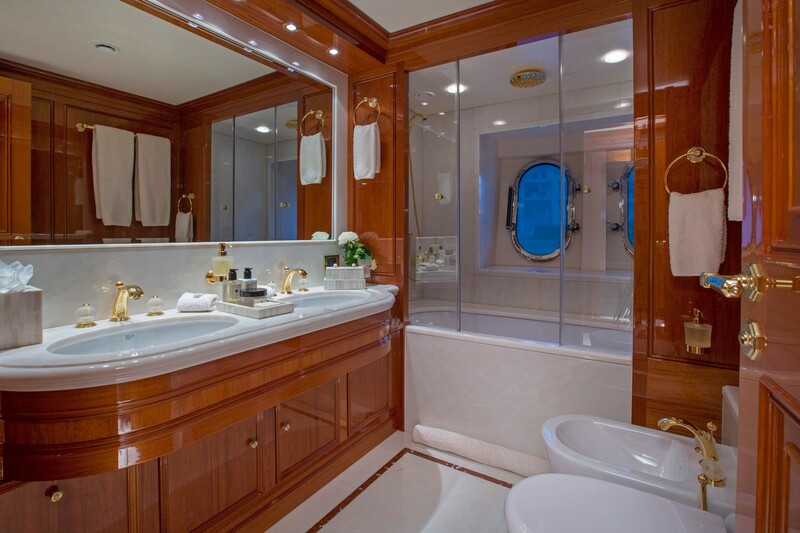 In 2015/2016 DOUBLE DOWN received a comprehensive refit with beautifully renovated interiors by Evan K Marshall. 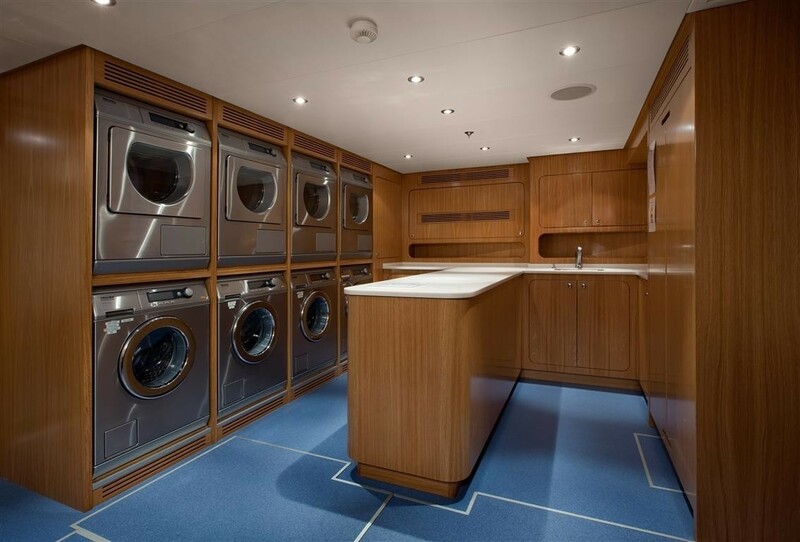 Spreading over five large decks DOUBLE DOWN offers a tankdeck with service areas and useful spaces for laundry and storage. 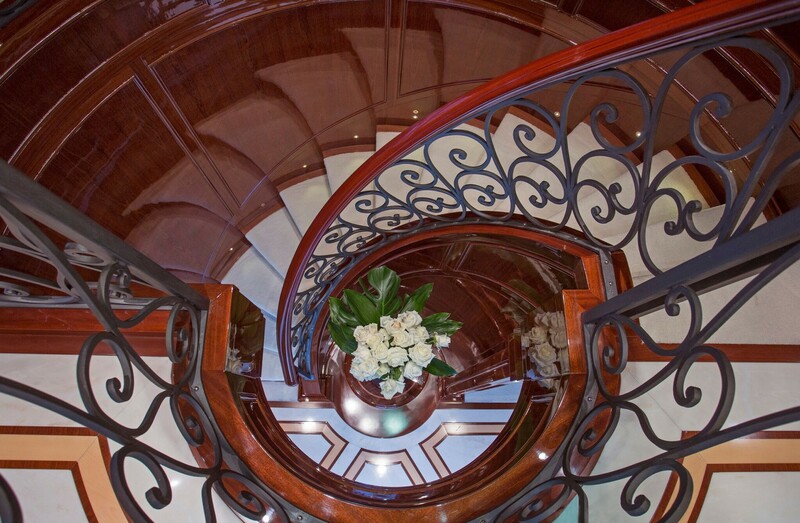 This area can be easily reached thanks to an elevator connecting all five decks. 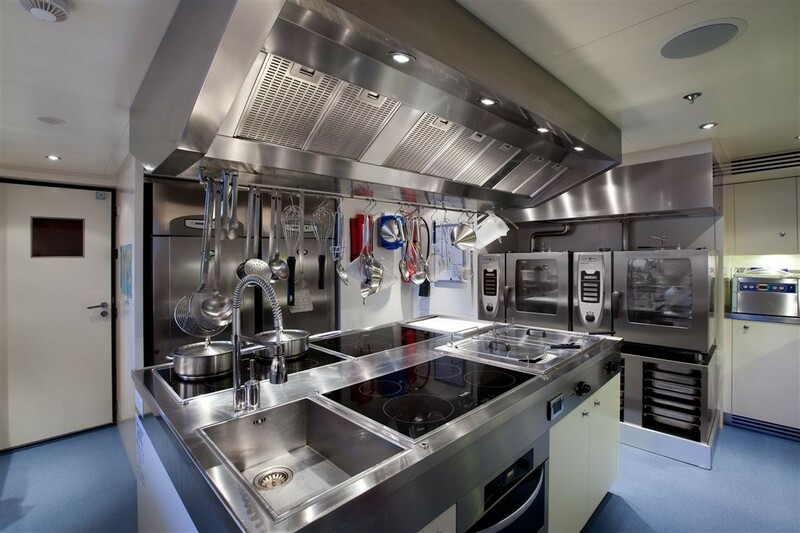 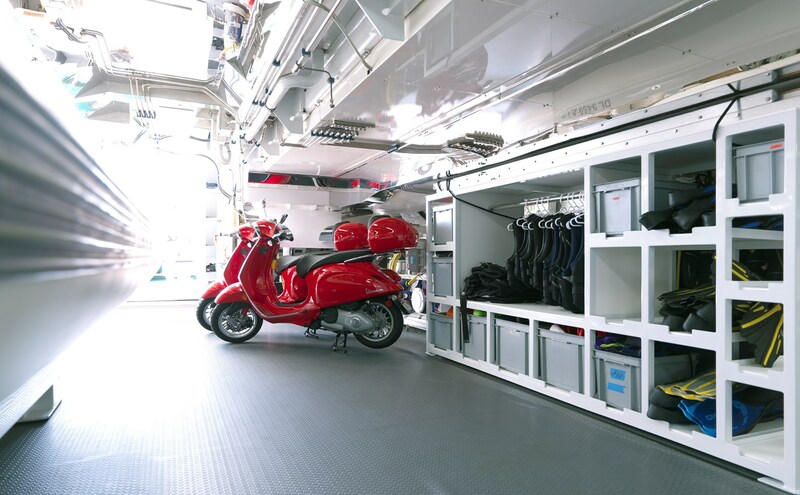 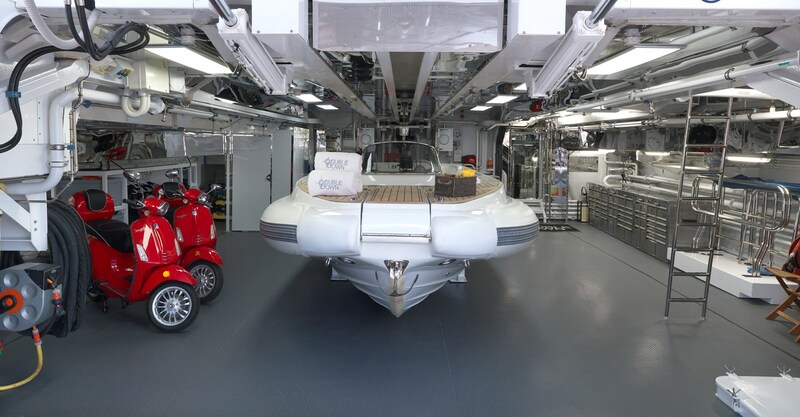 The lower deck hosts the garage and the engine room, whilst the guest and crew areas are situated forward. 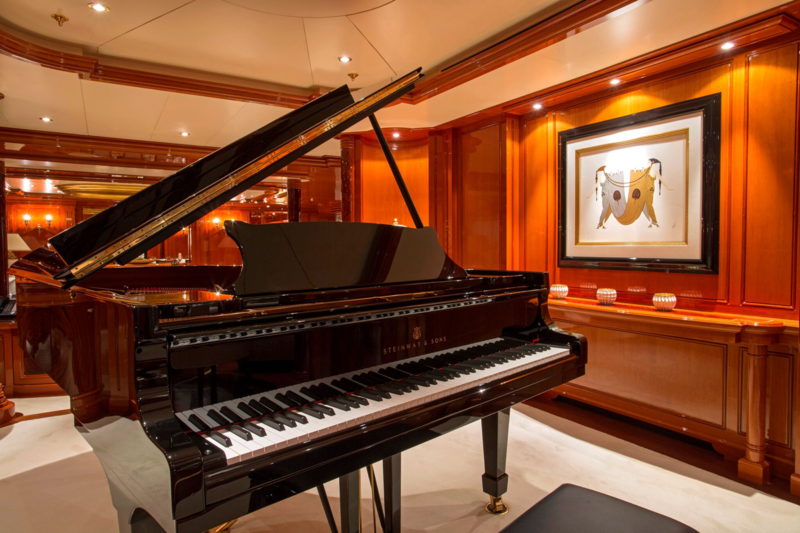 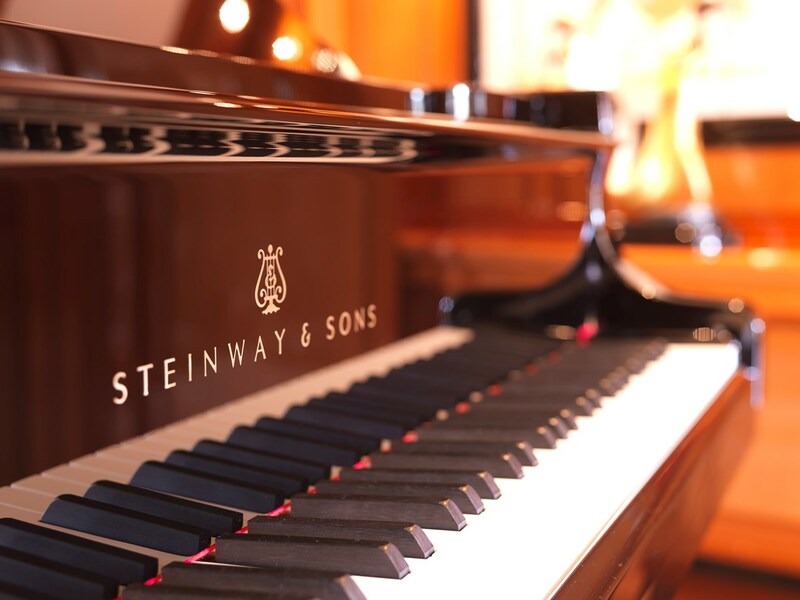 Moving up, the main deck faces a spacious veranda with two areas for relaxation and a piano room with wonderful Steinway grand piano which opens up to the saloon and the dining table able to seat up to 18 people. 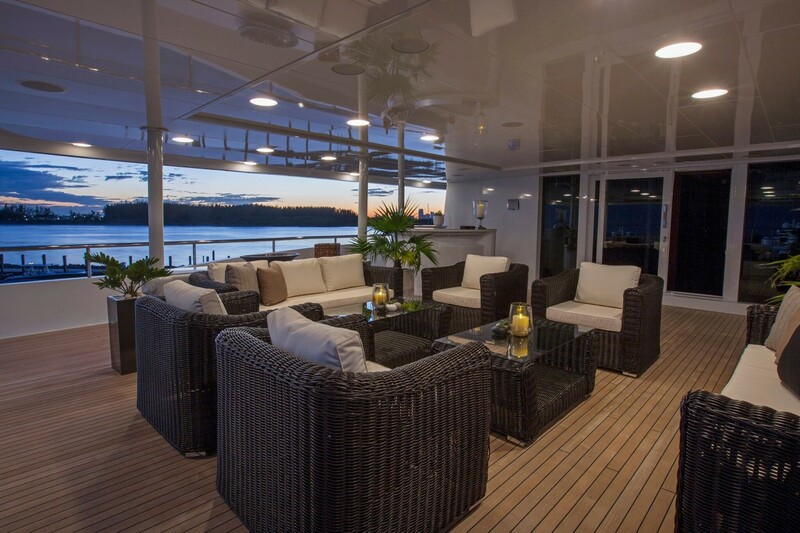 This deck offers three guest cabins. 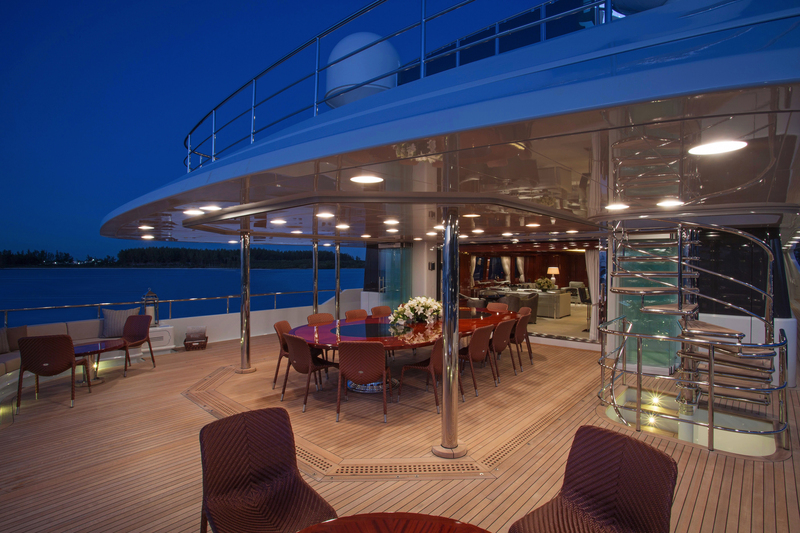 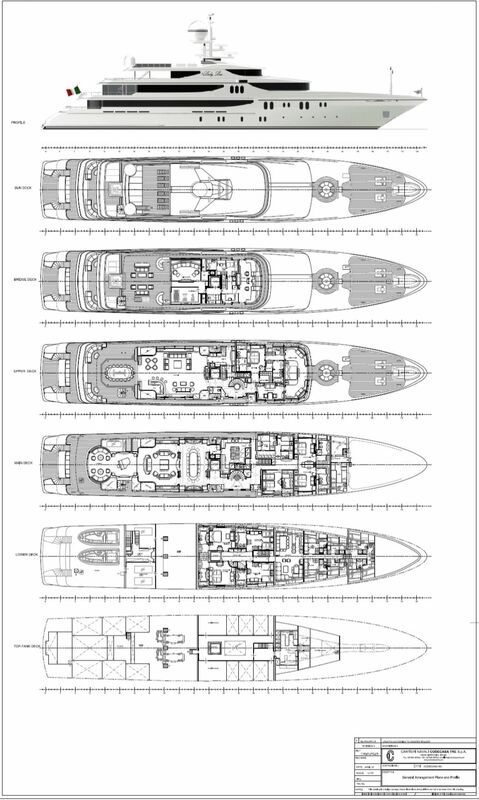 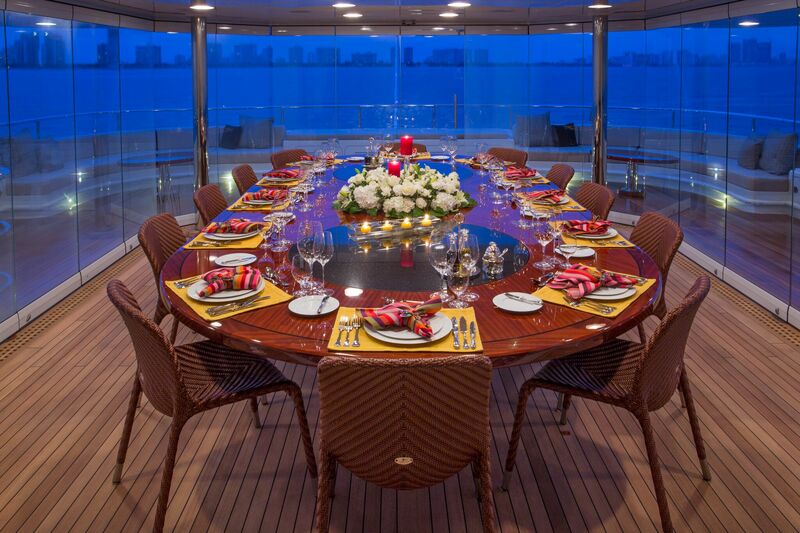 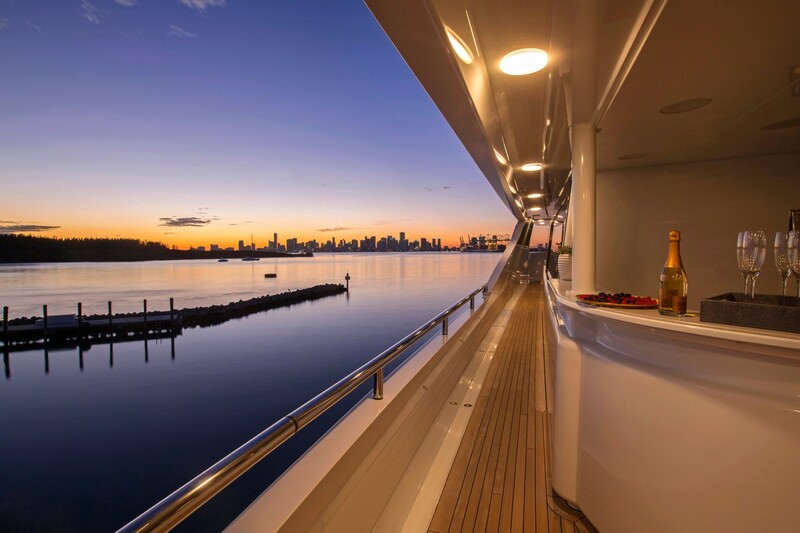 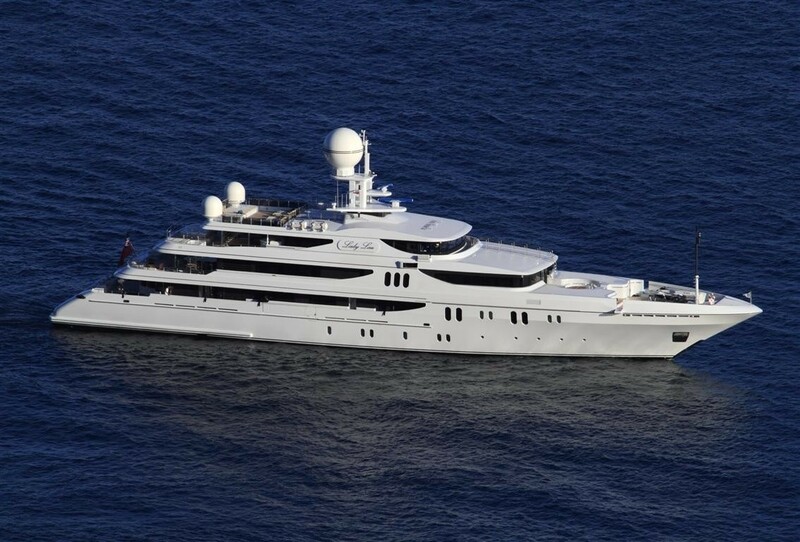 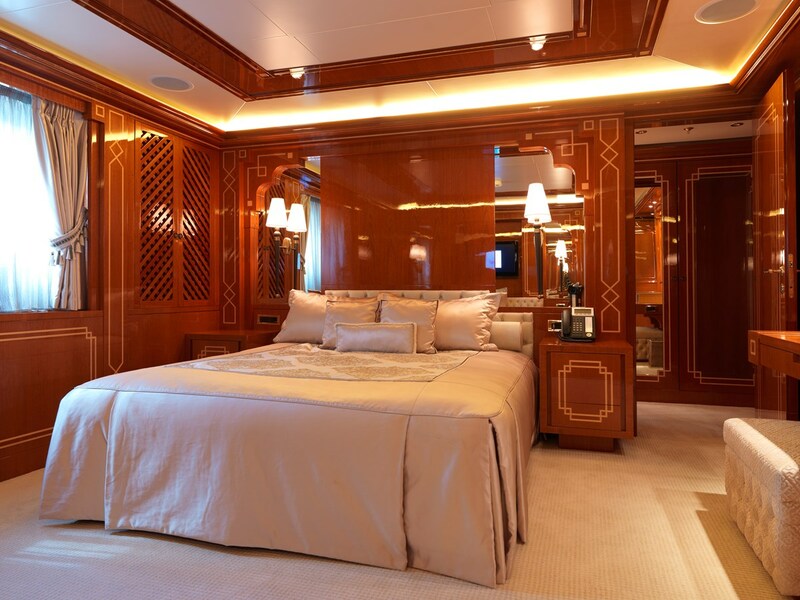 The upper deck, with yet another dining table and a large saloon with a bar and a games table, also hosts the Owner’s suite with a full beam stateroom, private en-suite bathroom and other luxury amenities. 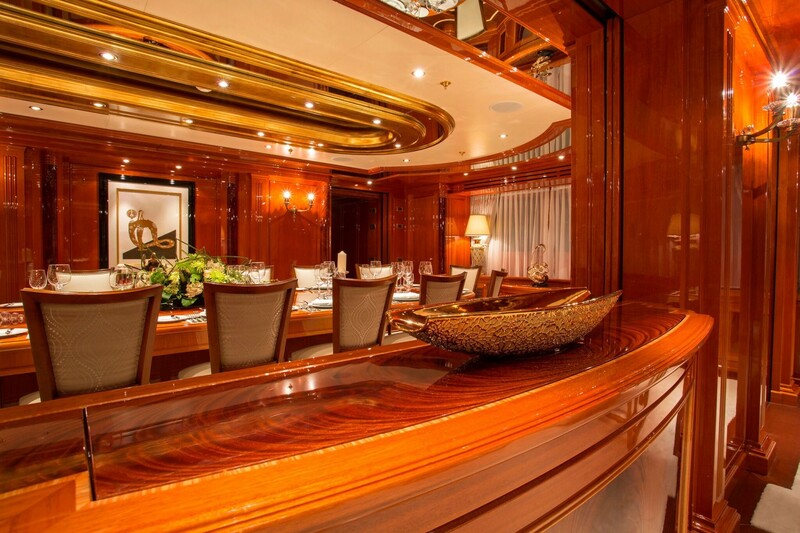 The Owner’s suite has interconnecting doors to a further VIP. 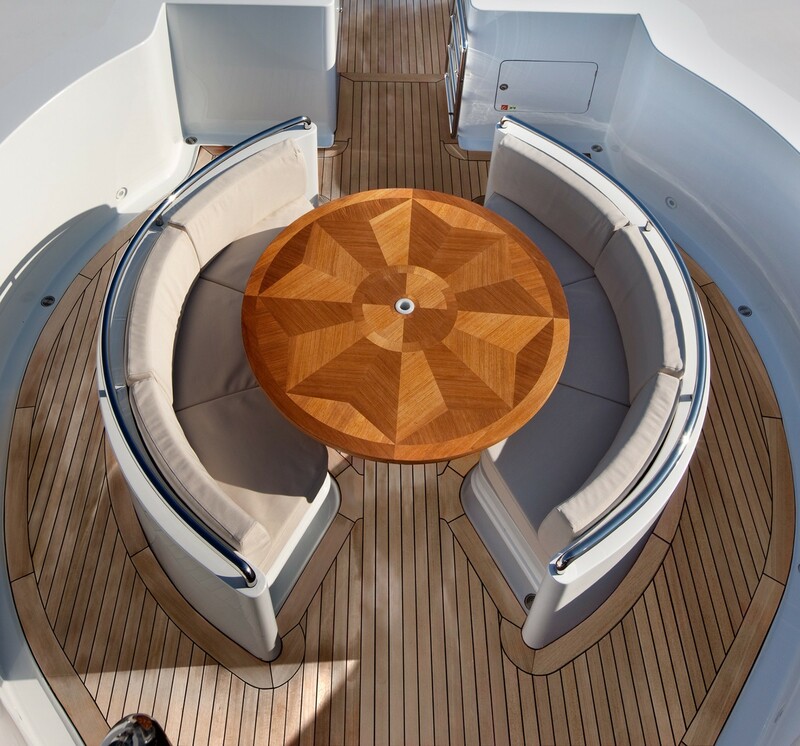 The wheelhouse of DOUBLE DOWN provides guests with a relaxing spa pool with sofas, a cinema and a gymnasium, with a sun deck offering a spacious area with sun pads. 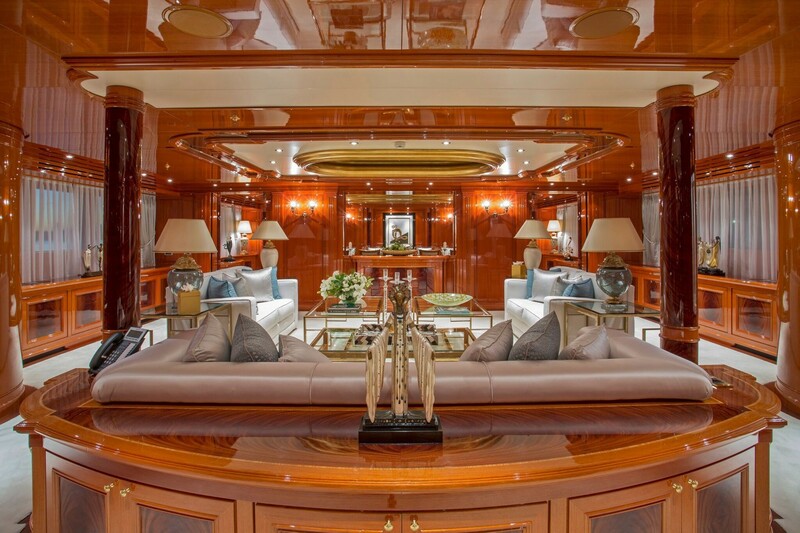 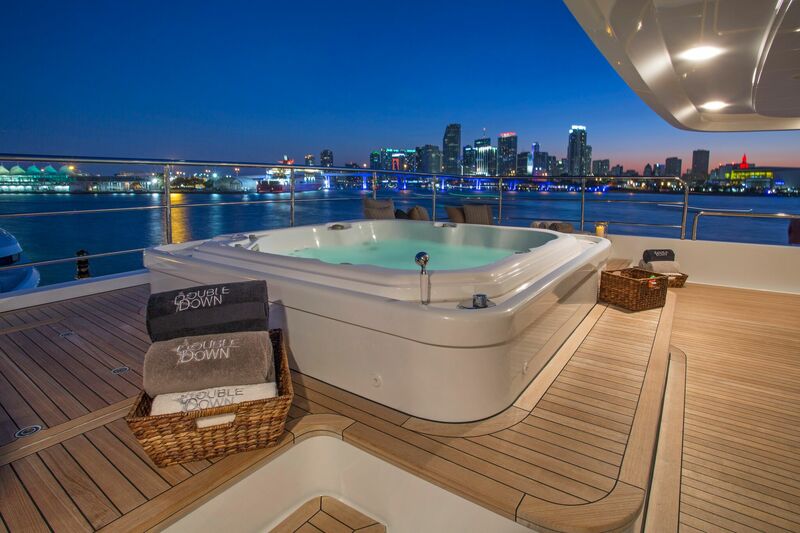 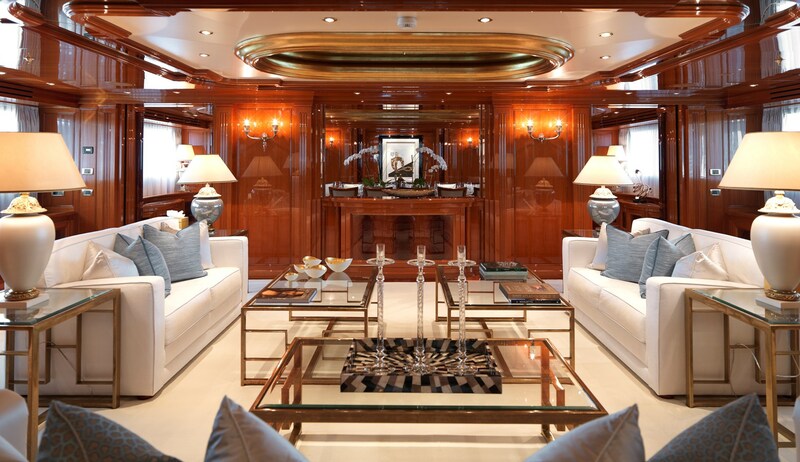 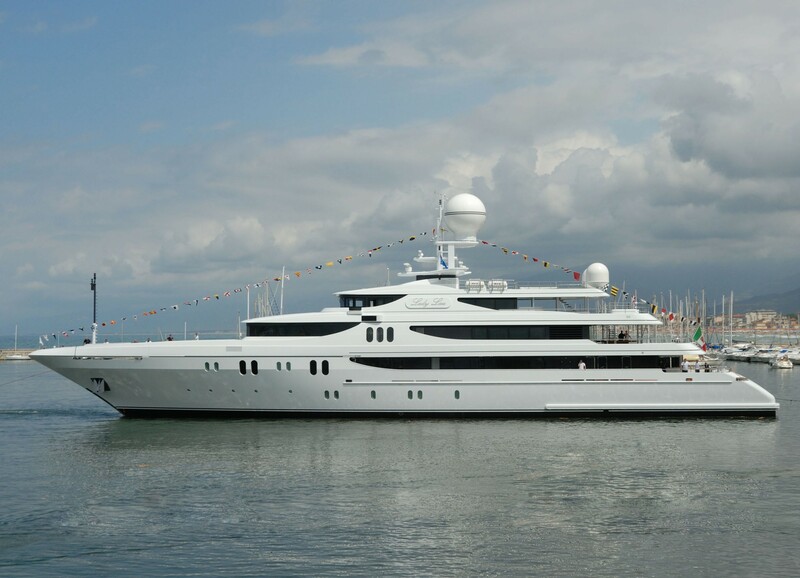 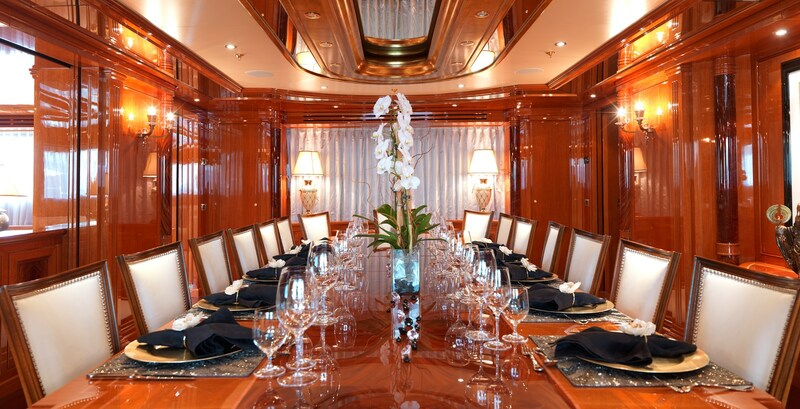 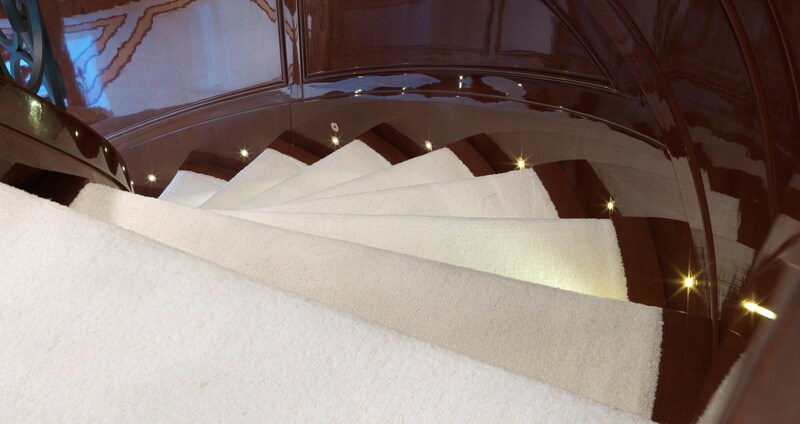 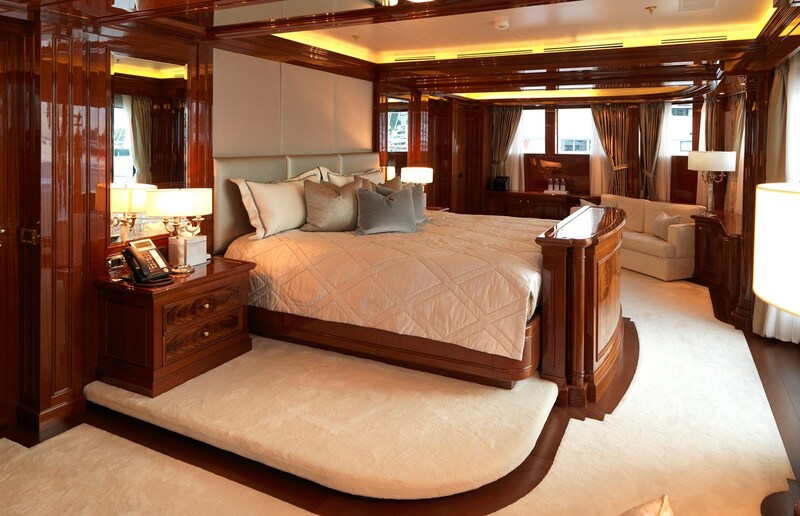 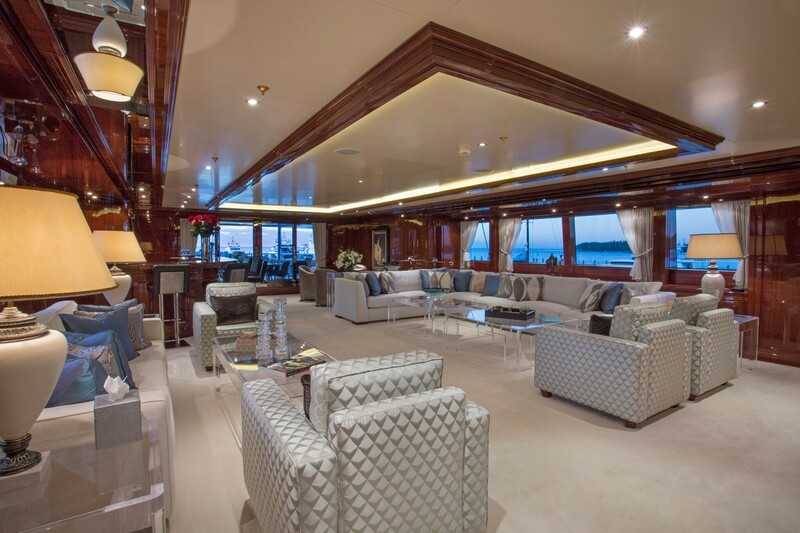 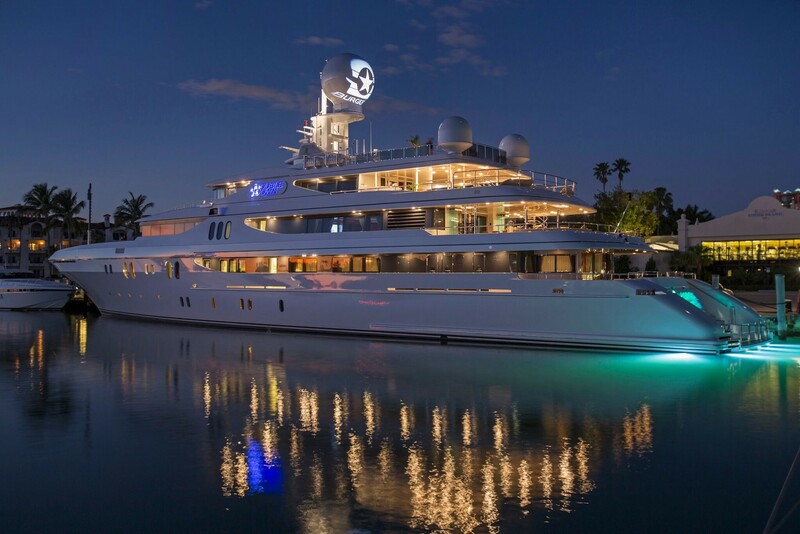 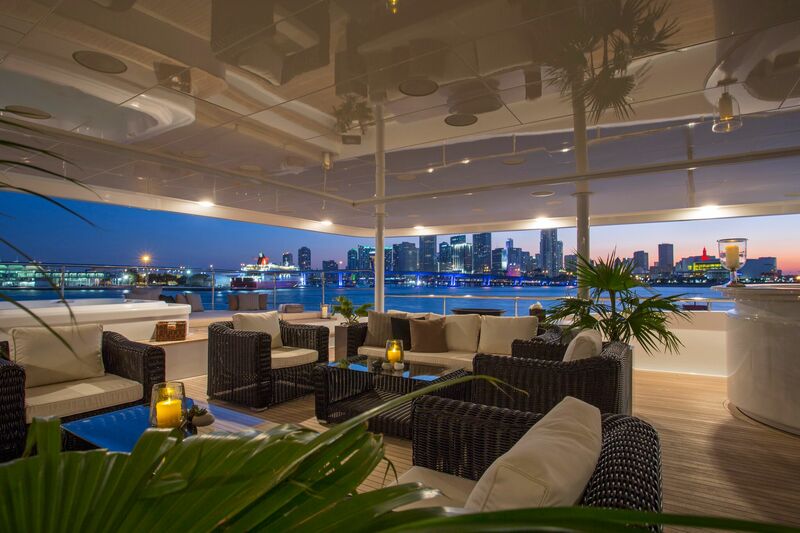 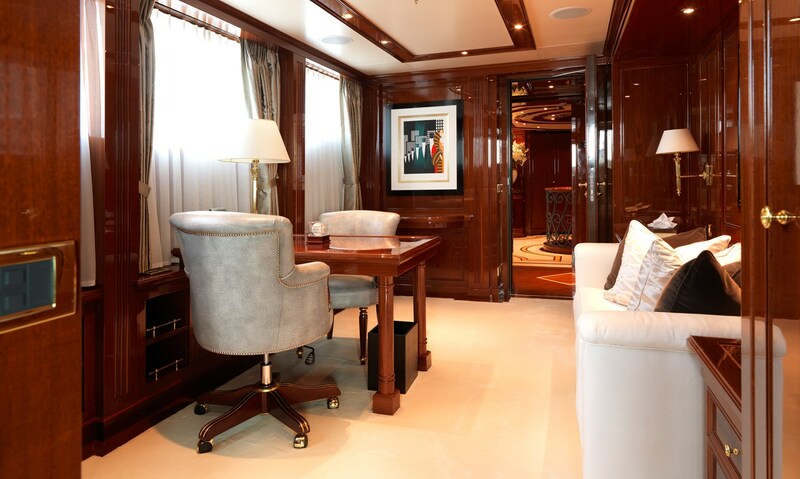 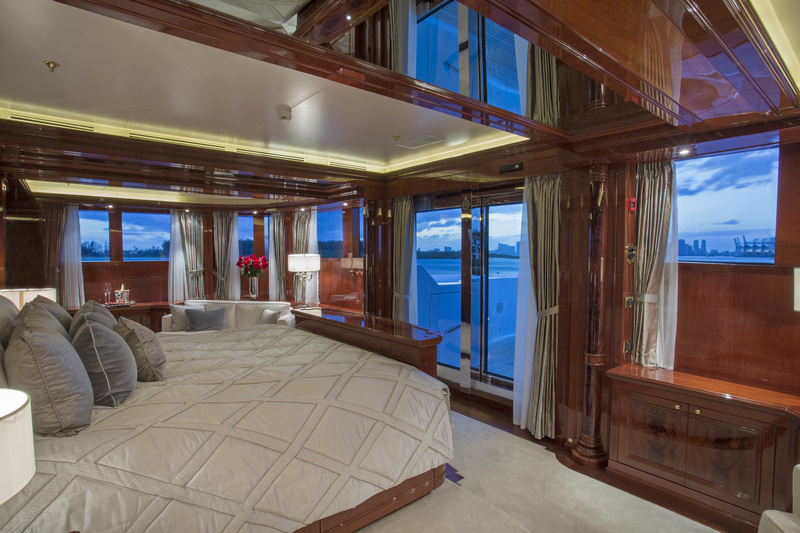 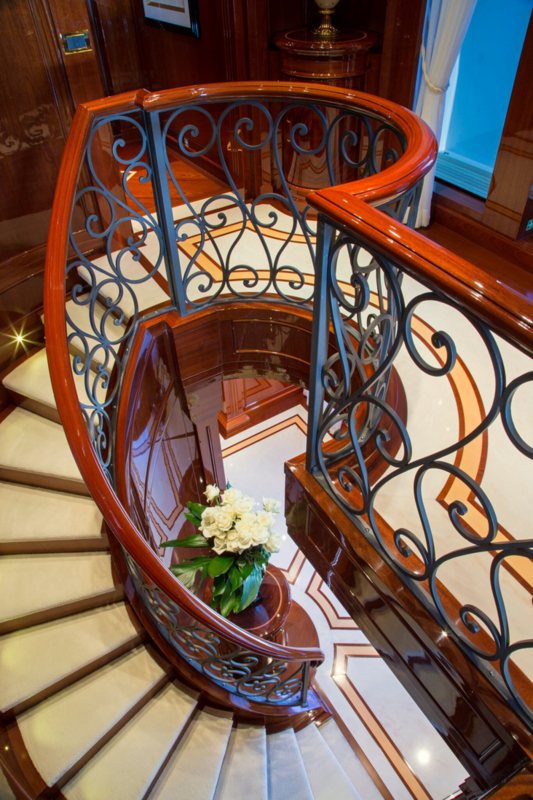 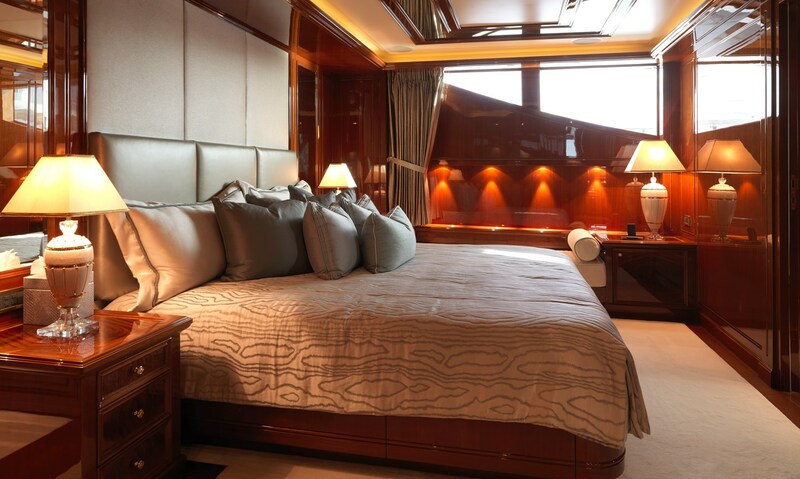 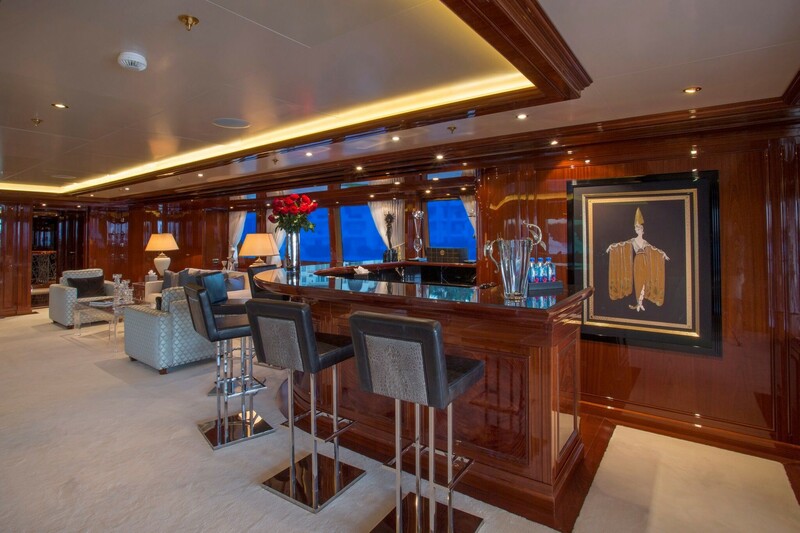 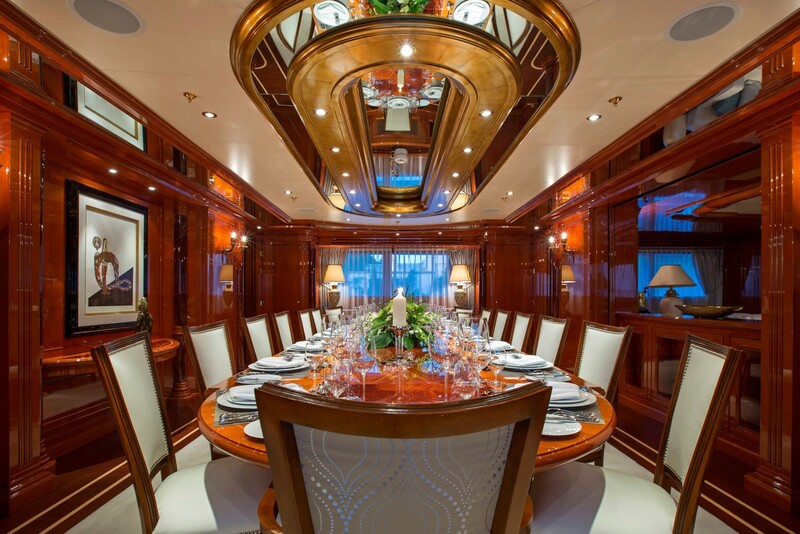 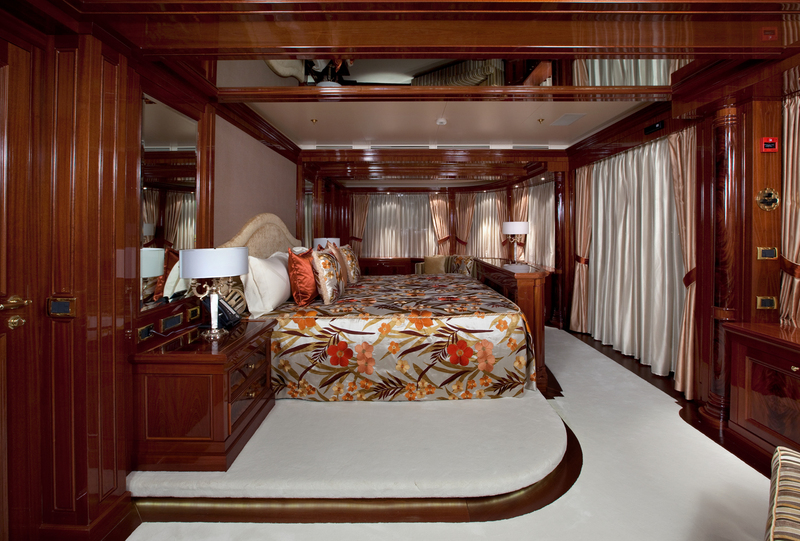 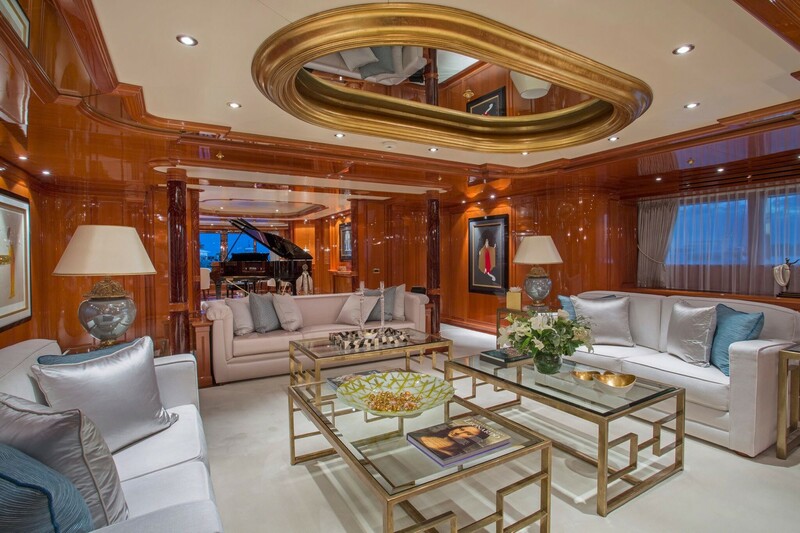 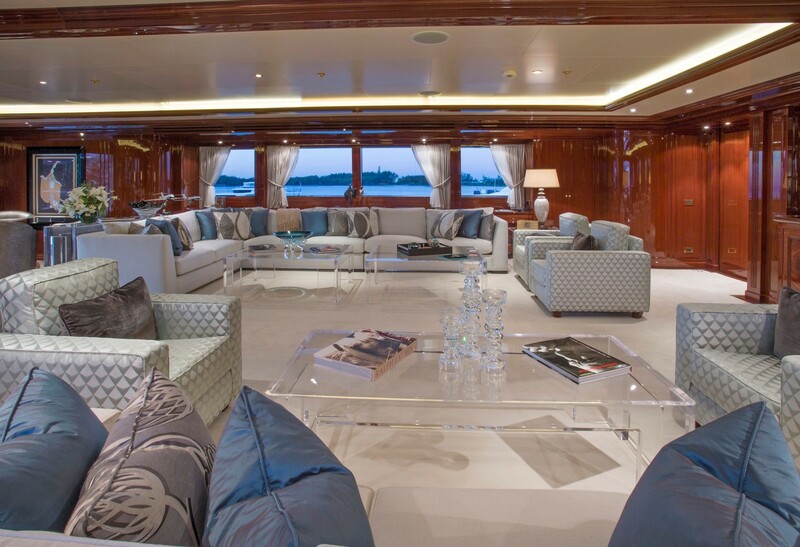 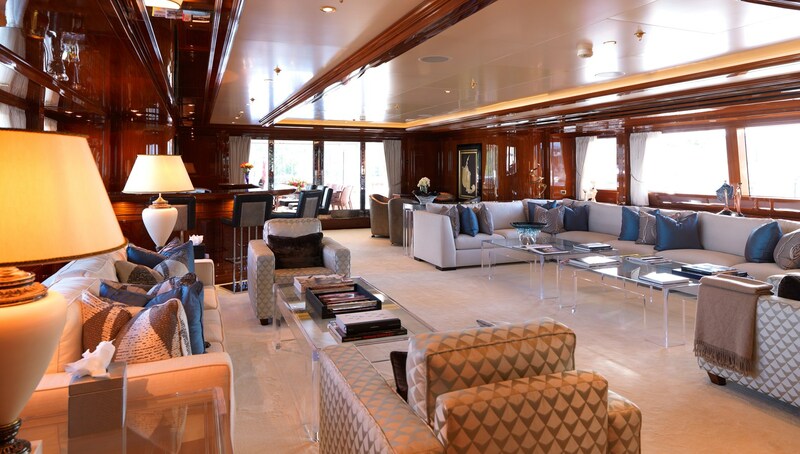 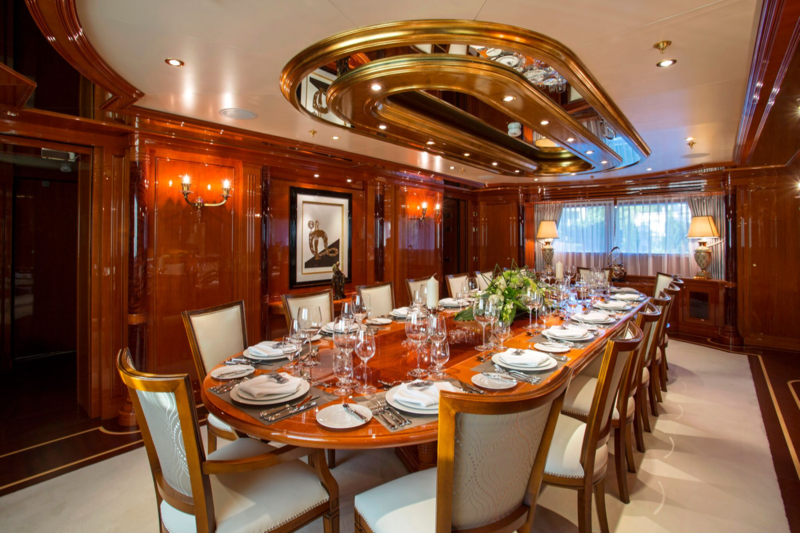 This striking motor yacht boasts very classic interiors with plenty of marble, mahogany wood and upholstery. 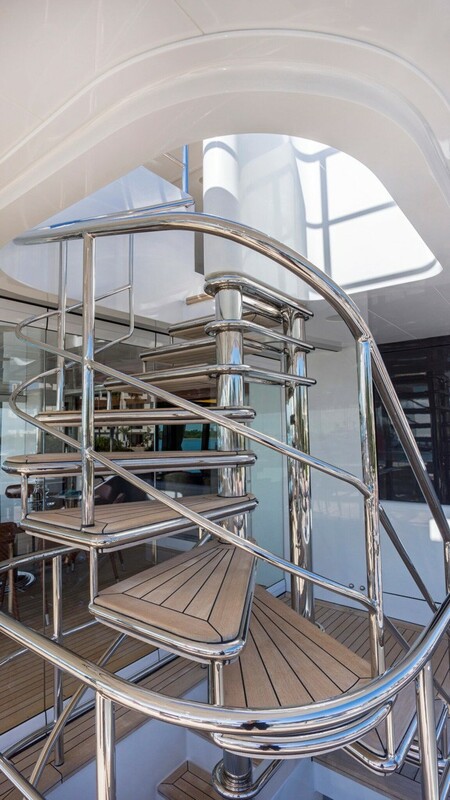 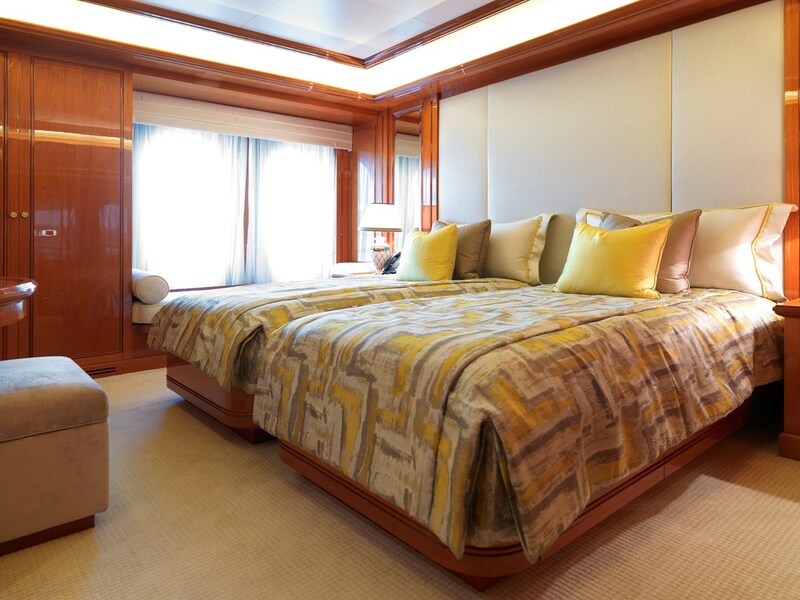 Great care is given to all guest areas, in particular to the four suites located on the lower deck, each featuring different style and colour scheme as requested by her Owner. 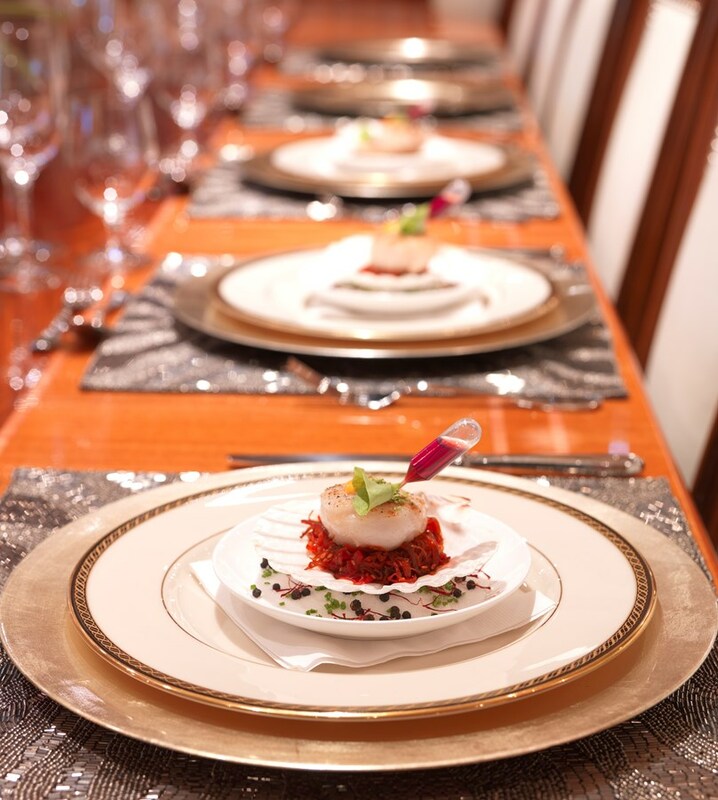 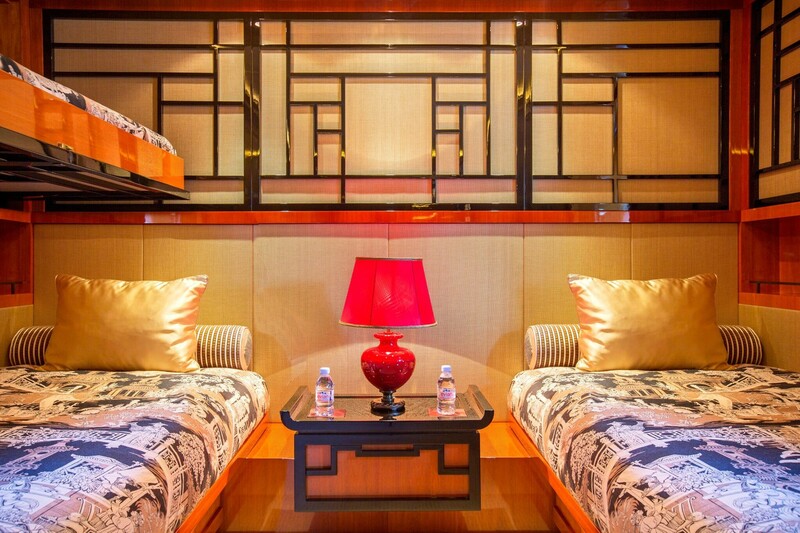 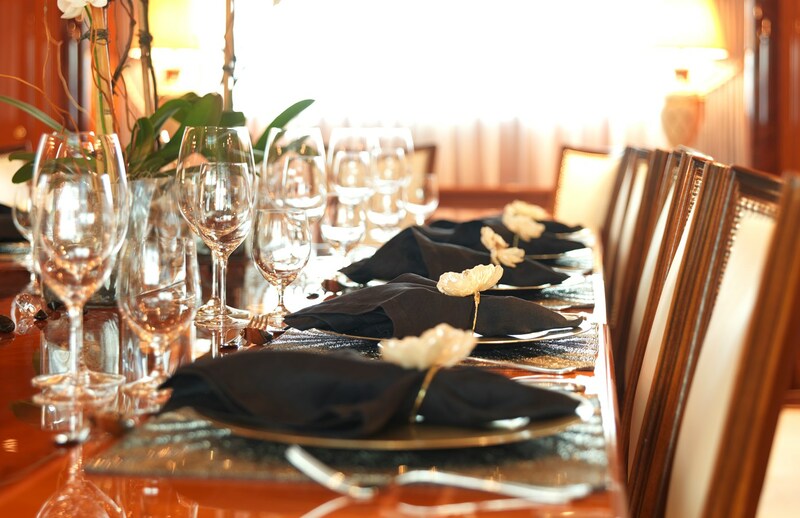 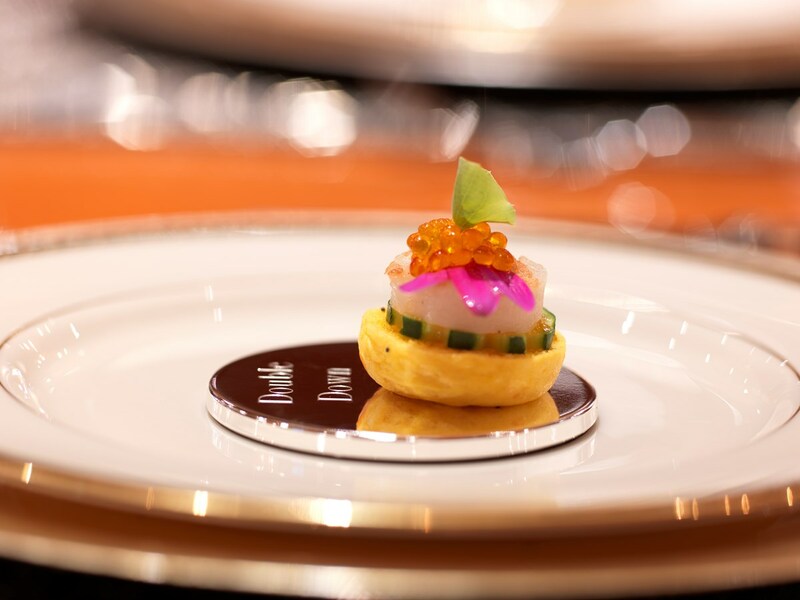 The various cabin themes include: Thai, Chinese, Egyptian and minimalist in order for the Owner to be able to host his foreign guests in a comfortable and inviting atmosphere. 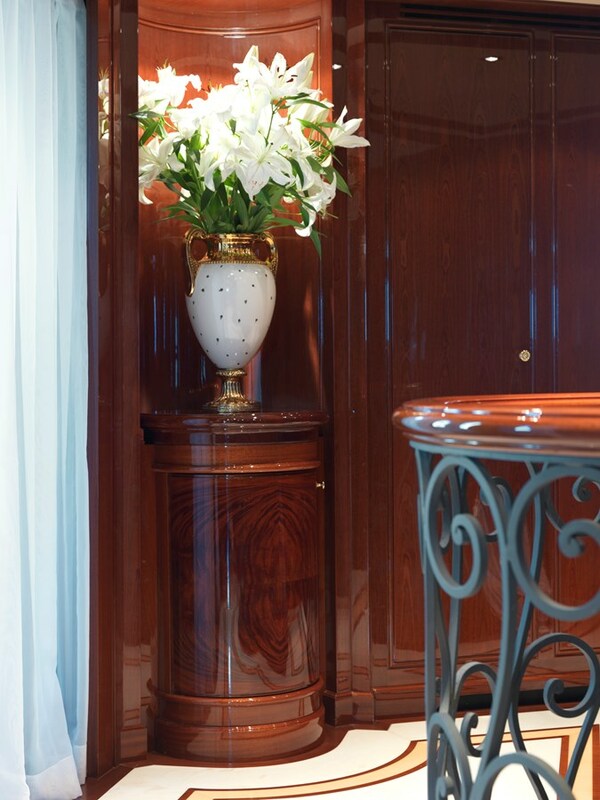 The difference in styles is the main characteristic of this vessel, which is very rich in decorations and materials. 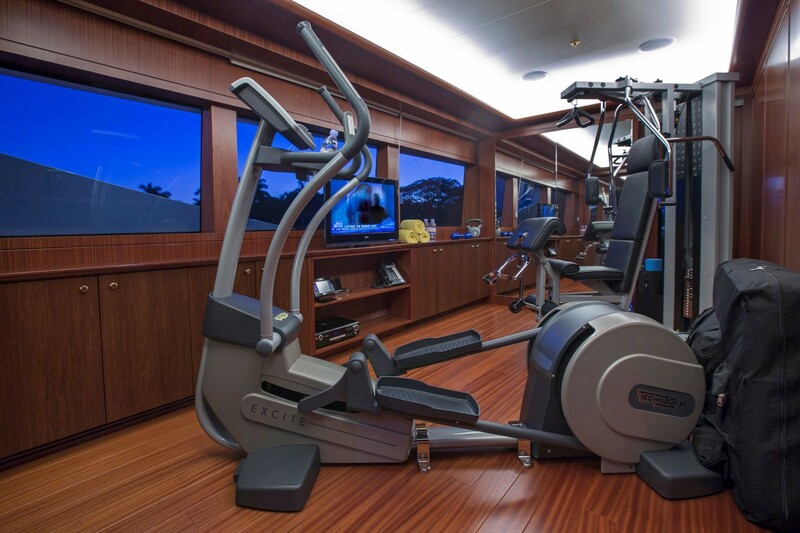 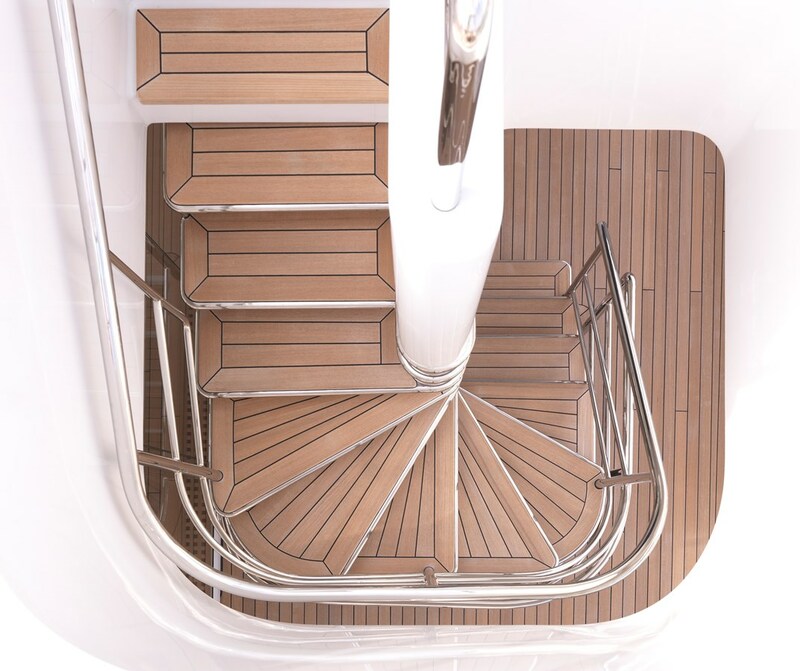 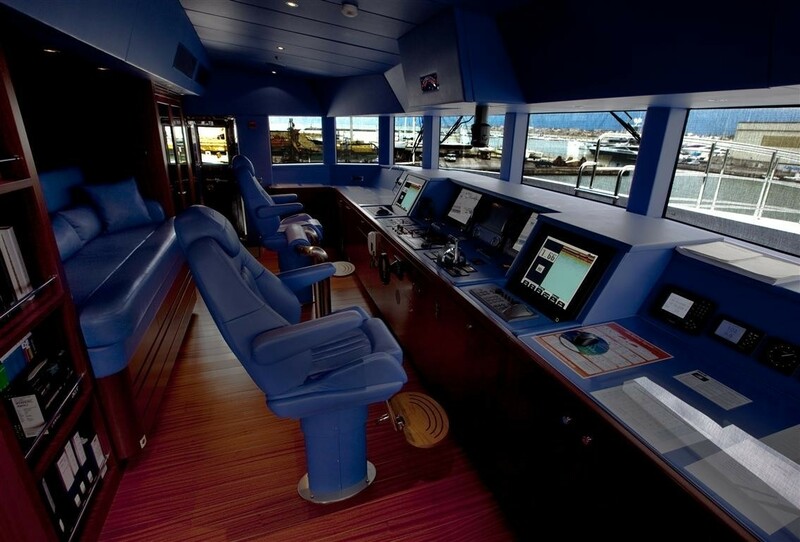 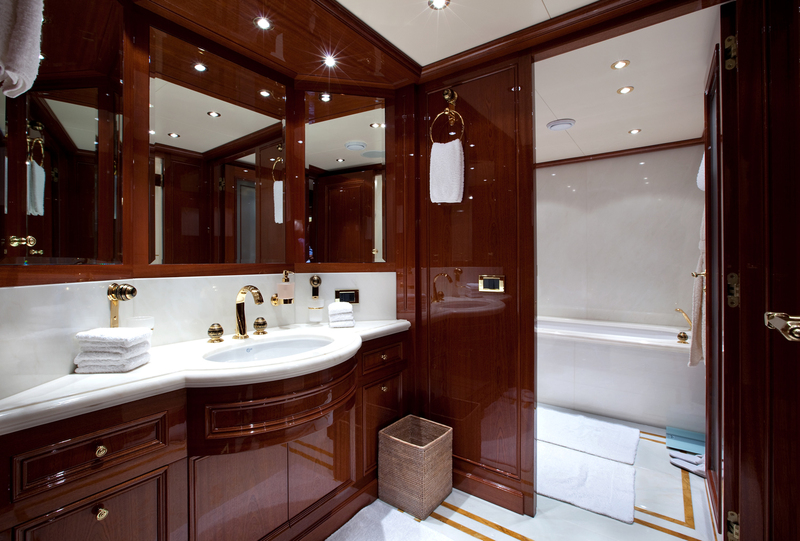 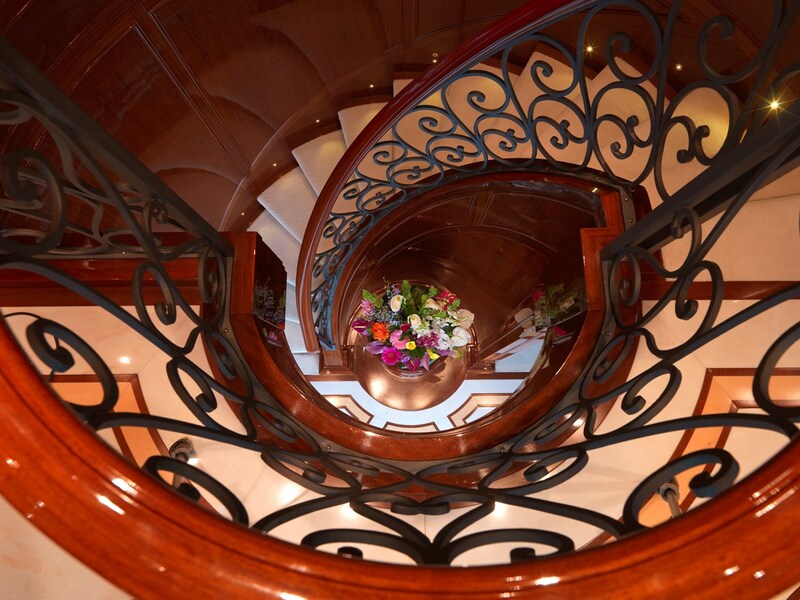 Mahogany is the wood used for the cabins but also throughout the rest of the yacht. 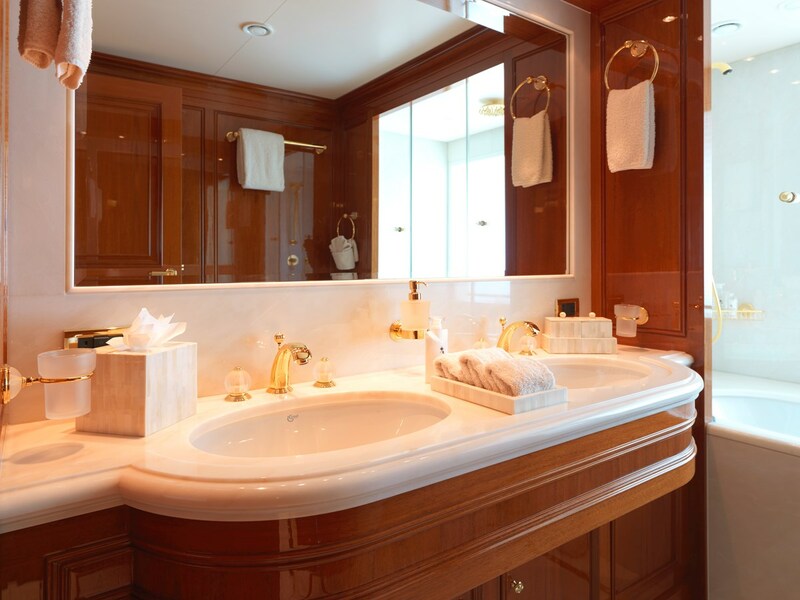 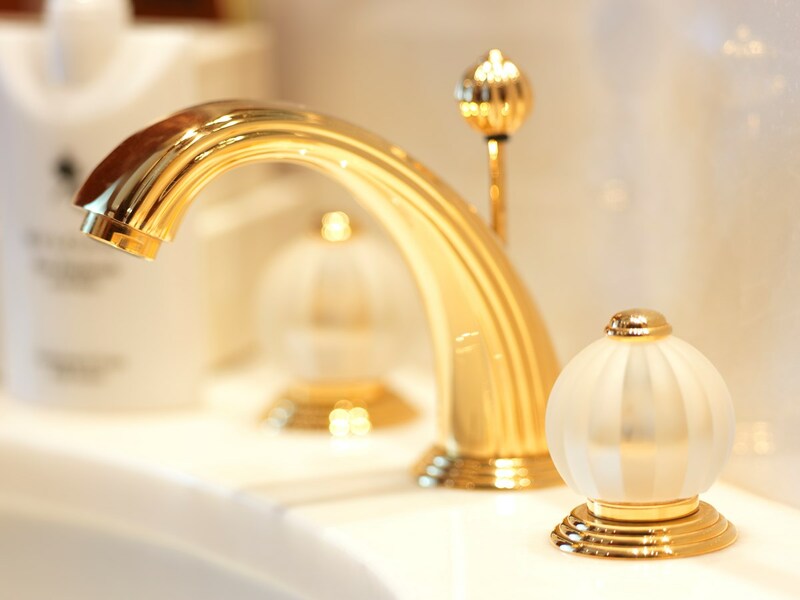 The marble bathrooms match each bedroom’s style, including taps, fittings and other furniture pieces. 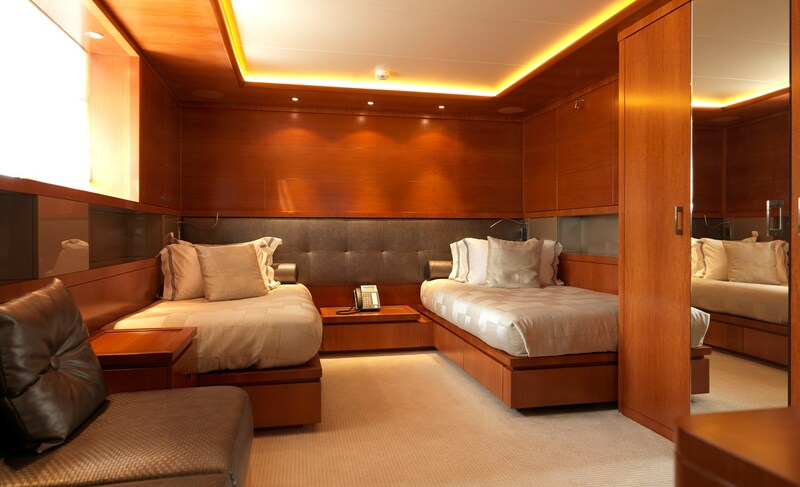 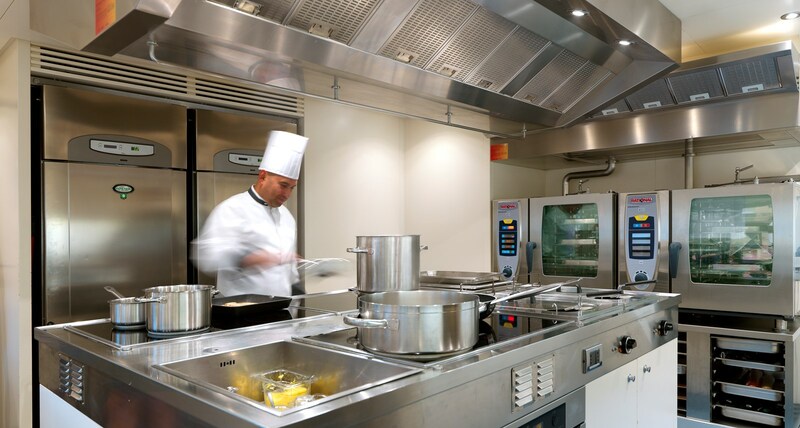 The ceilings in the cabins have a particular indirect lighting system and very few down lighters while the floors have been fitted with luxurious carpeting. 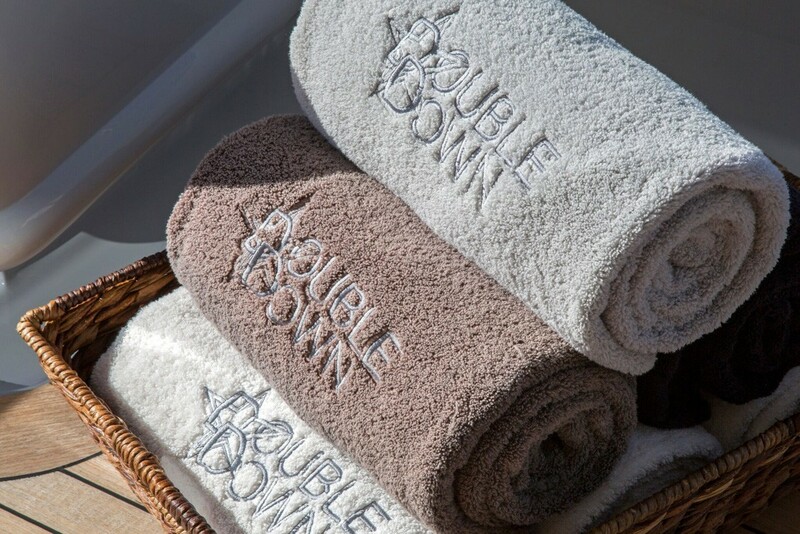 Aesthetically, DOUBLE DOWN reflects the Codecasa style with its striking bow and elegant, timeless lines. 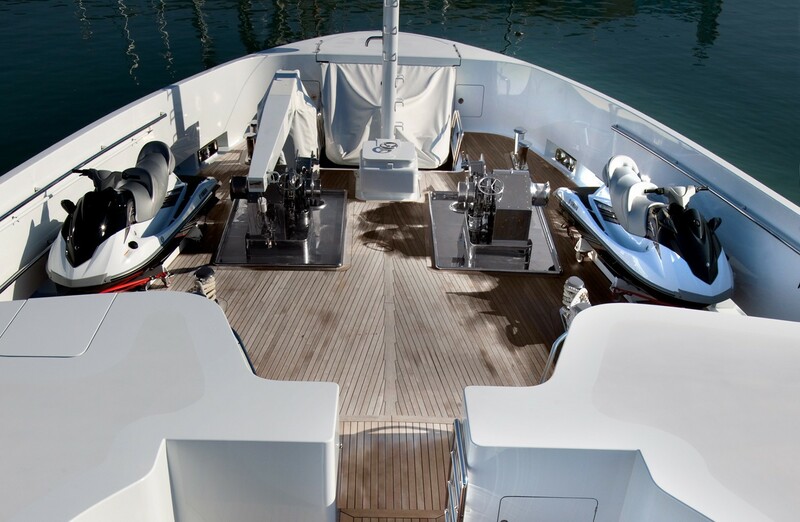 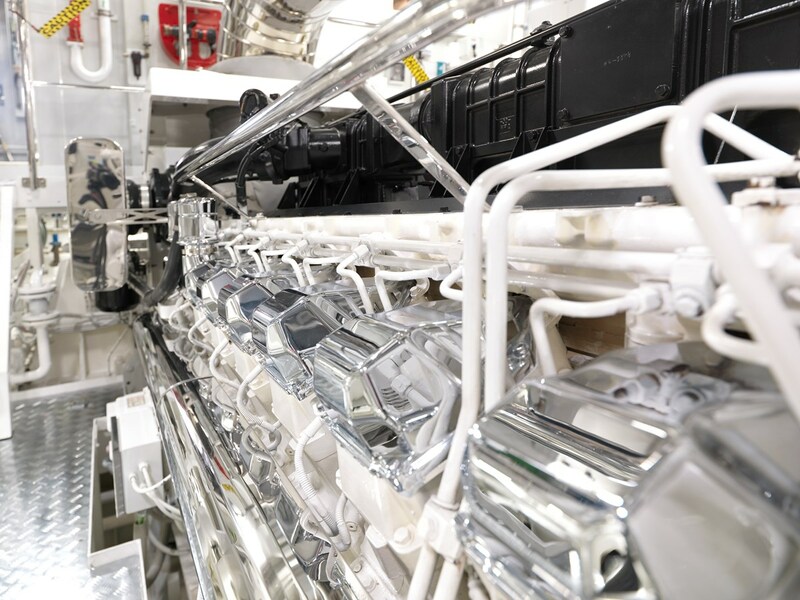 Two Caterpillar 3516B engines, each of 2448 HP, allow the yacht to reach 17 knots of maximum speed and a range of 5000 nm at 12 knots with the possibility to have an oceanic navigation. 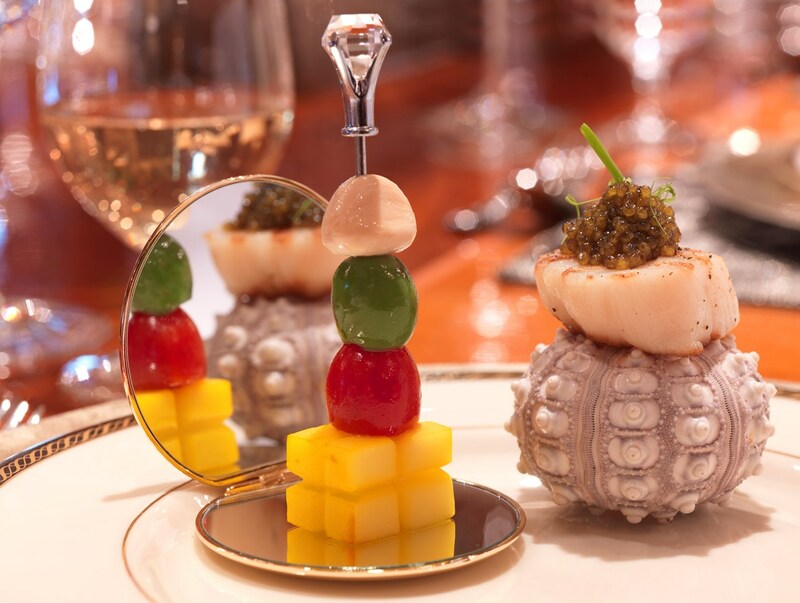 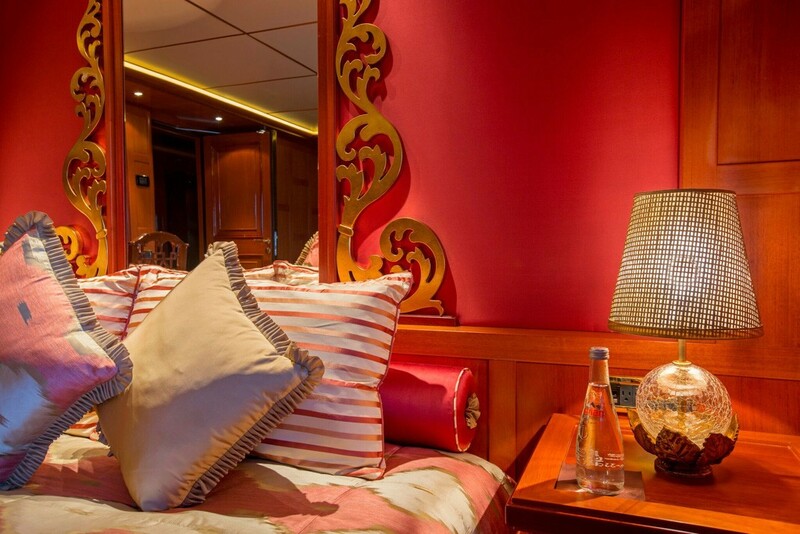 The yacht offers sumptuous accommodation for up to twelve charter guests in eight elegant cabins, each with its own particular theme style and decor. 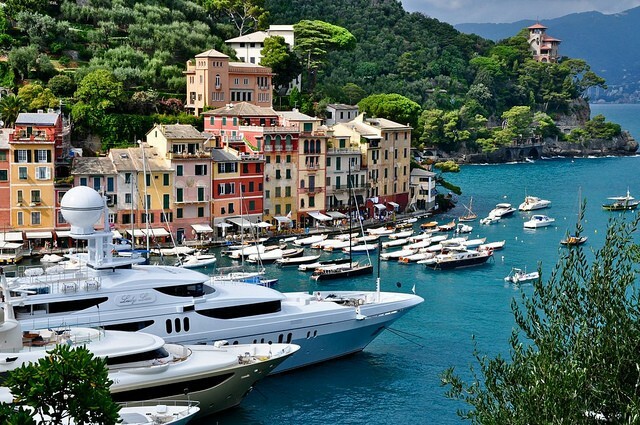 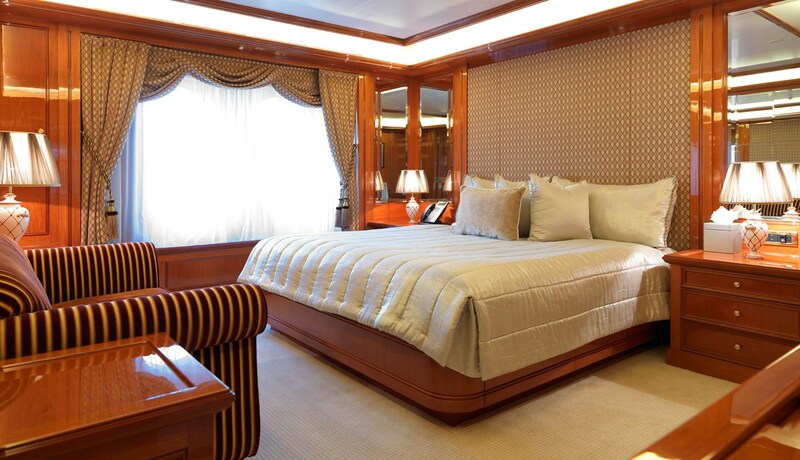 The layout includes one master stateroom, five VIP staterooms and three twin staterooms. 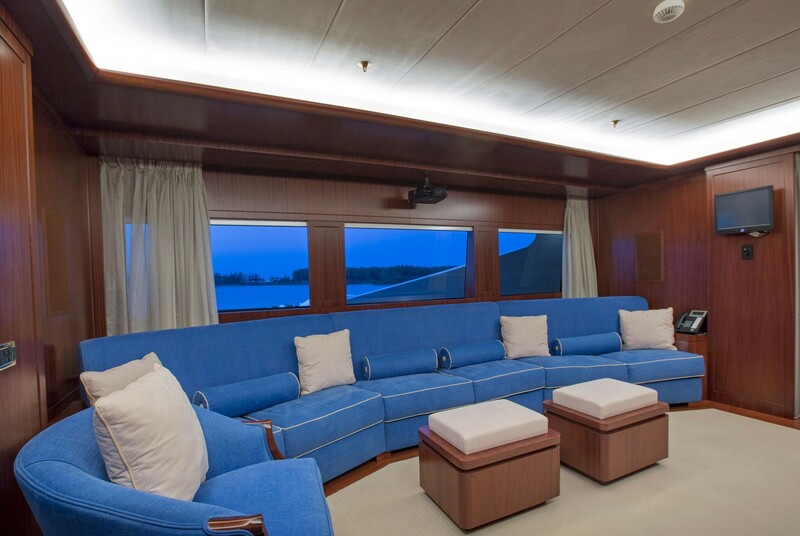 The upper deck features the full-beam owner’s suite as well as the spacious VIP suite. 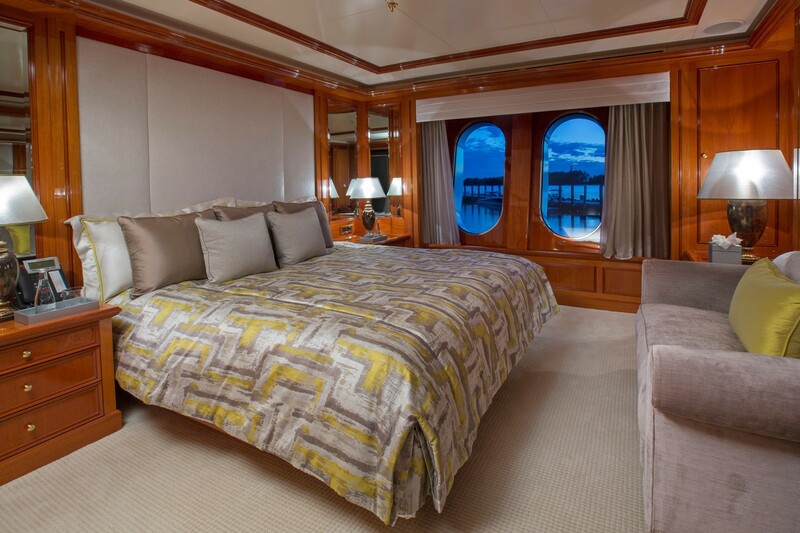 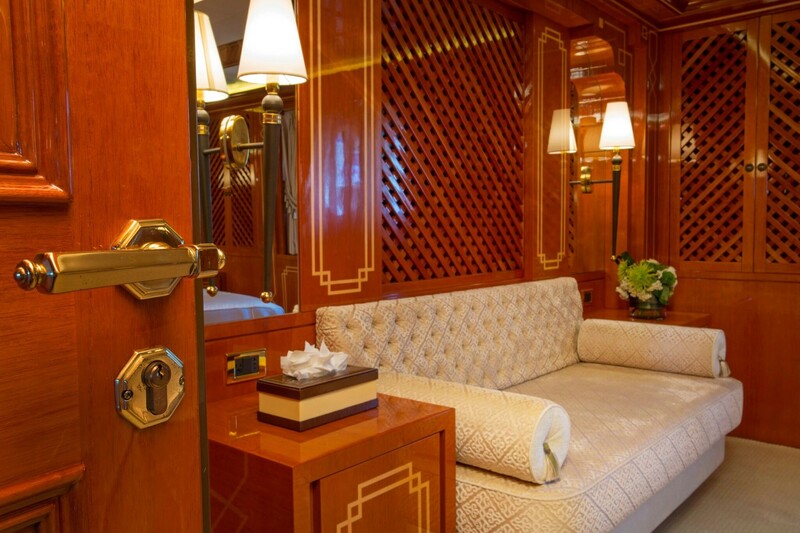 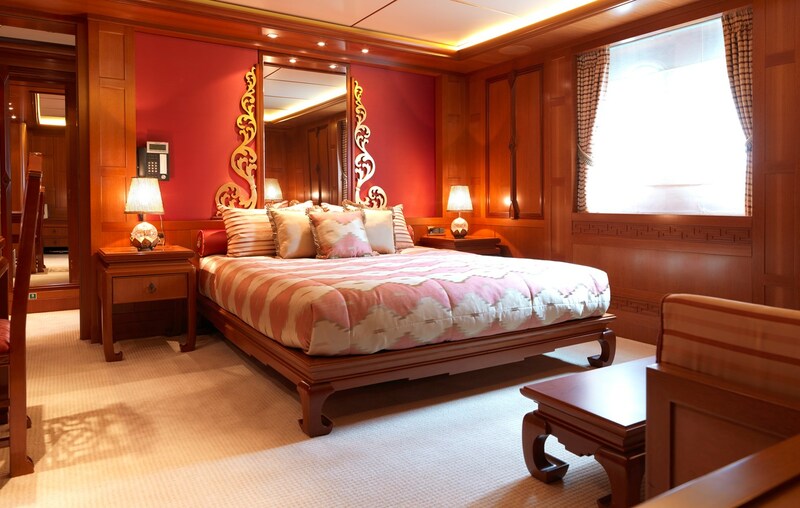 Two king-bedded staterooms and one twin stateroom have been placed on the main deck, while the lower deck offers one twin stateroom and two double staterooms - the Egyptian suite and the Thai suite. 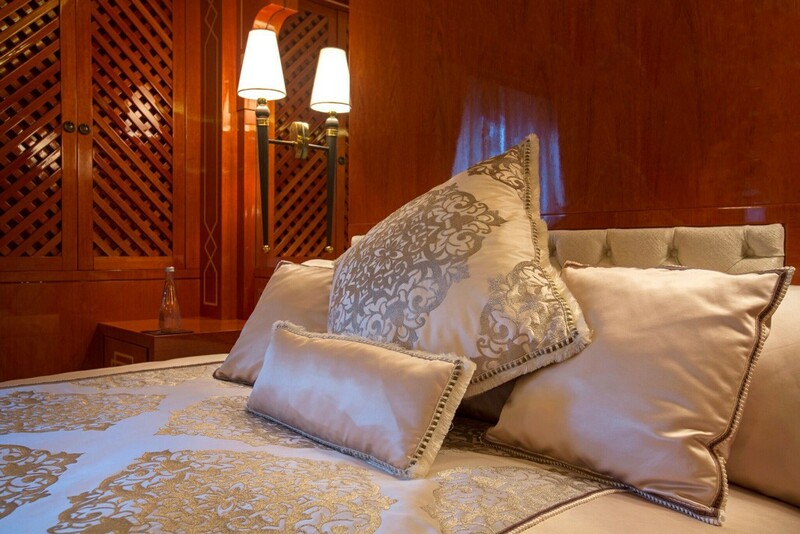 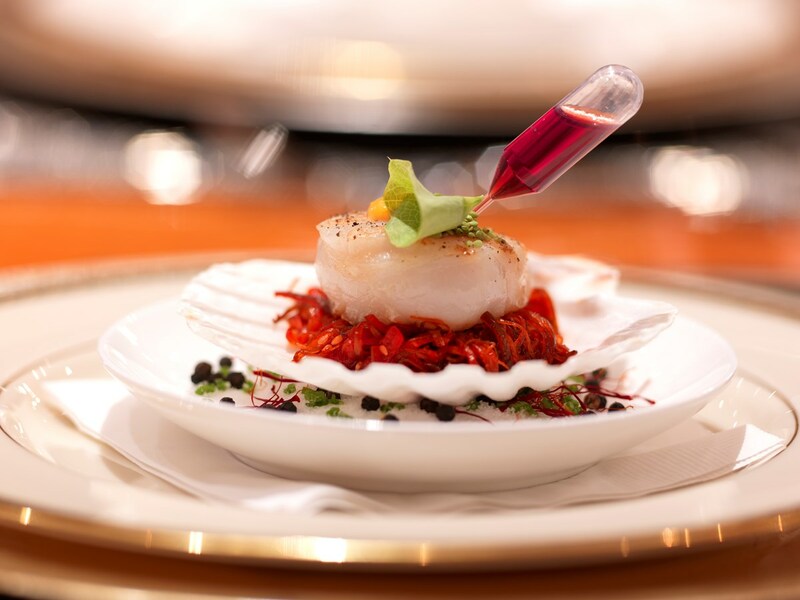 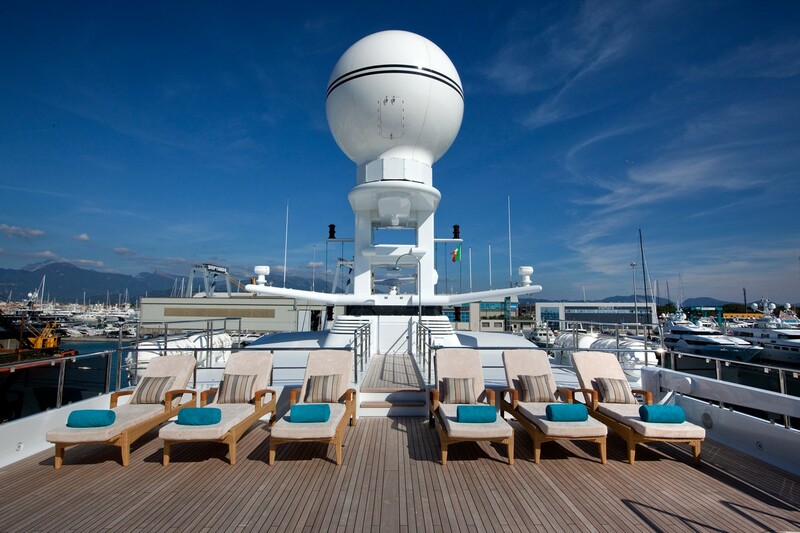 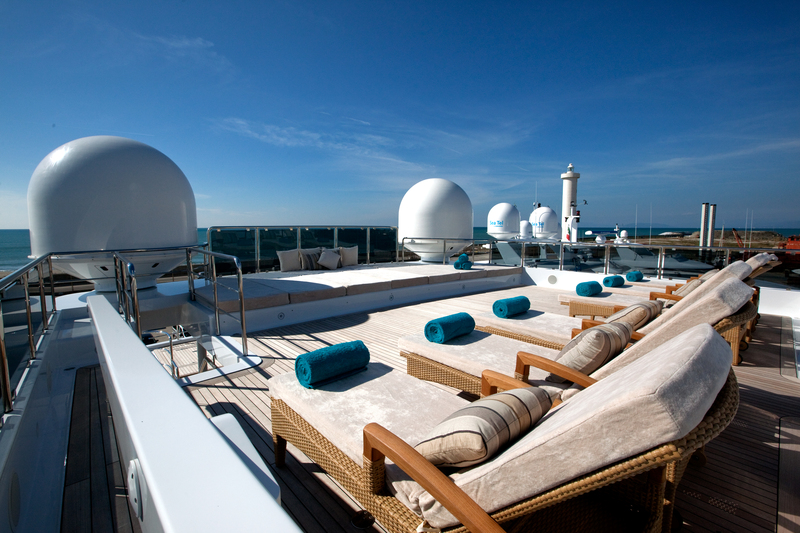 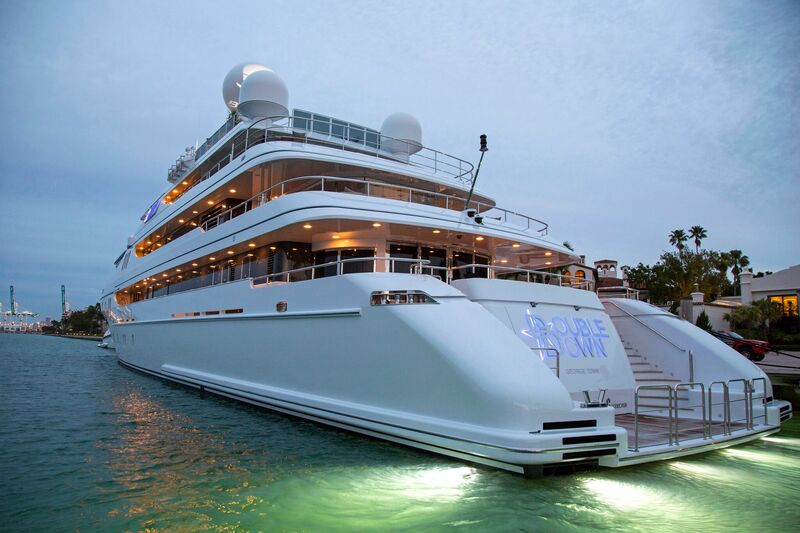 All double guest staterooms are considered on VIP level. 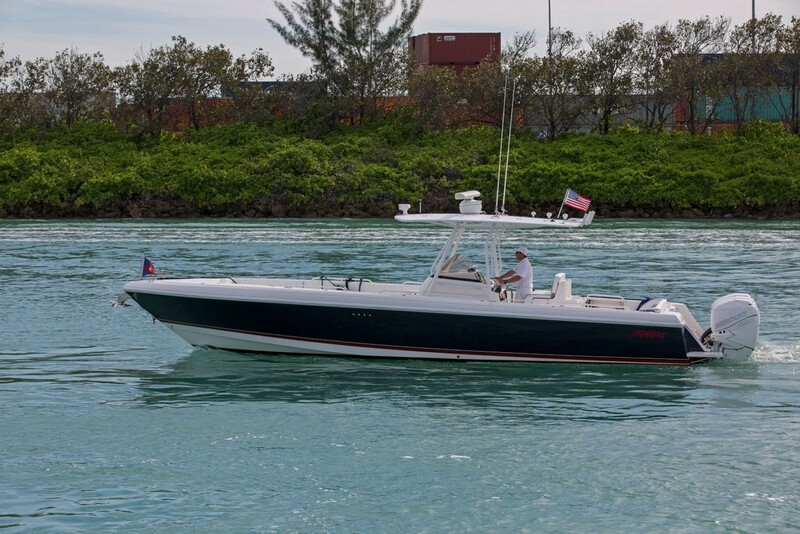 Tenders and toys include a Castoldi 23 (7m) Jet Tender with 315 Hp diesel engine, a 42ft (12.8m) MTI centre console towed tender with 4 x 300 Hp Mercury outboard engines, two Yamaha VX Cruiser waverunners, one Seadoo GTX, two Seabobs (F5), one Aquaglide trampoline, one Aquaglide Climber, two paddleboards, two inflatable kayaks, a large selection of inflatable towable toys, Waterskis, wakeboard and wakesurf board, snorkelling equipment as well as fishing equipment. 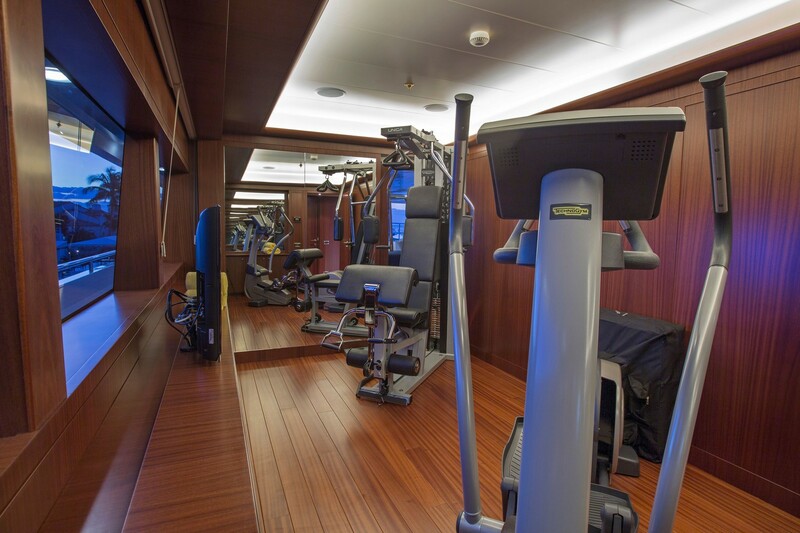 The gym is equipped with a selection of free weights and a bench, an elliptical trainer, a treadmill and Unica multigym.